carlynorama | Apple App/iTunes password in the clear in Log file? 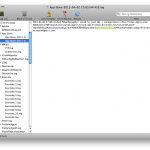 Apple App/iTunes password in the clear in Log file? and software is just a bunch of gossips, don’t y’know. local log file. Can anyone recreate this? Is it already fixed? Not sure what you did, but that log doesn’t exist on my system, and I do use the App Store. Good luck, though.